Doris Michaels started the only UK Cosmetics Company created exclusively for black women 10 years ago. Realising other multi-nationals products may have darker shades of their own make-up range, they do not actually suit black woman’s skin. Doris herself says "I want to give every black woman the opportunity to enhance their personal beauty with the best possible cosmetics to suit their skin. 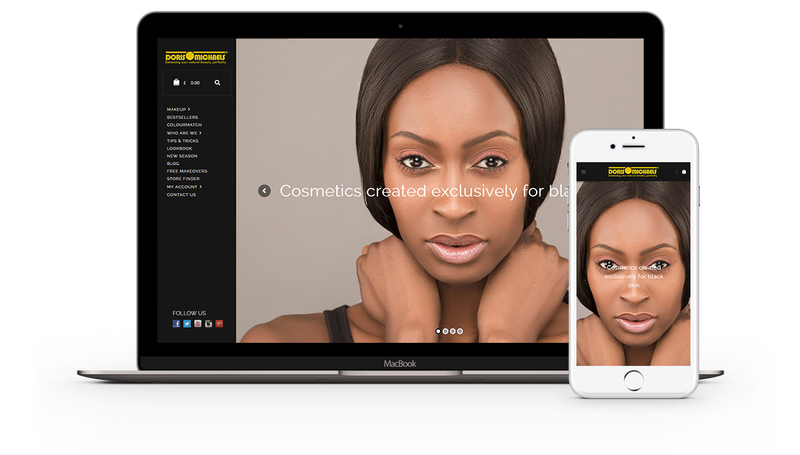 Our products ARE better than MAC for black skin – why pay their prices? Doris Michaels celebrates dark skin." We were approached by their marketing manager Mandy Lewis who recommended our services after having worked with us on another project. After an initial meeting and project scoping, we recommend a WordPress & WooCommerce solution. The end results is a stunning, modern e-commerce store which showcases Doris’ products in the best light possible. Crisp, hi-res photography and a sleek responsive layout now allows Doris Michael’s products to compete on a global scale.